RTX 2060 is a powerful mid-range graphics card in the RTX 20 series lineup and is positioned below the RTX 2070. 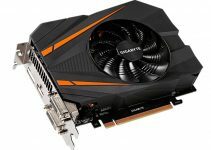 It is said to be the replacement for the GTX 1060, but in reality it is much more powerful than it and its performance is comparable to that of GTX 1070 and GTX 1070 Ti series. RTX 2060 is officially the cheapest Ray Tracing card available that is also capable of AI / Deep Learning. 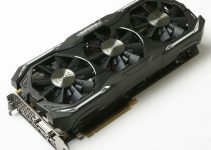 The launch of RTX 2060 has raised some questions regarding its proper place in the market and how it is compared against the mid and high-end Pascal series graphics cards that include GTX 1060, GTX 1070 and GTX 1070 Ti. So, to clear all your doubts regarding it, here I am going to make a very clear cut comparison between these cards. 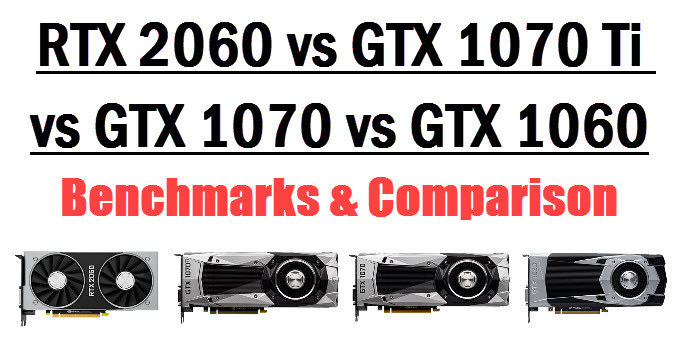 Below is a comparison between RTX 2060, GTX 1070 Ti, GTX 1070 and GTX 1060 graphics cards based on their specifications, performance, pricing, power consumption and features. RTX 2060 is built on the Turing GPU architecture with 12nm fabrication process while others are built on the Pascal GPU architecture with 16nm process. All these cards have CUDA Cores as their main processing unit, but RTX 2060 goes a little further and has got Tensor Cores and RT Cores for AI and Ray Tracing. 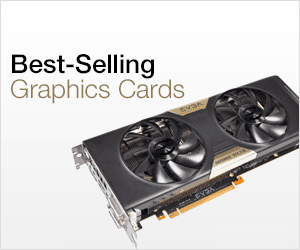 The GPU and architecture used in these graphics cards are as follows. GTX 1060 6GB comes with 1280 CUDA Cores, GTX 1070 with 1920 CUDA Cores, GTX 1070 Ti with 2432 CUDA Cores and RTX 2060 has 1920 CUDA Cores. 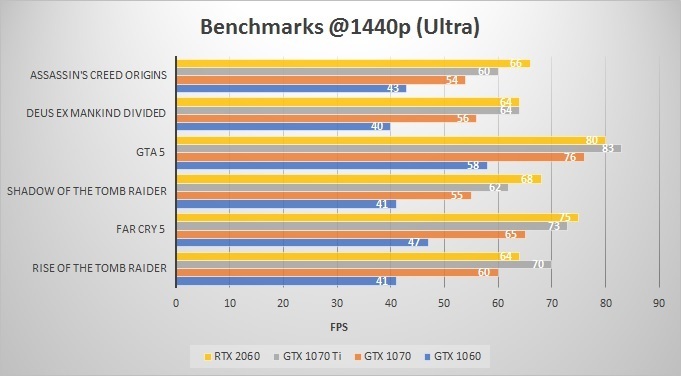 Although, GTX 1070 and RTX 2060 have the same amount of CUDA Cores i.e 1920, but due to difference in their GPU architecture, RTX 2060 is able to generate a bit more performance in gaming and other tasks. Also, the additional Tensor & RT Cores in RTX 2060 makes it a great workstation card too compared to the other Pascal series cards here. Both GTX 1060 and RTX 2060 comes with 6GB of memory but the former one has GDDR5, and the later one has GDDR6 that is much faster. The memory interface or bus width in both these cards is of 192-bit only. On the other hand, both GTX 1070 and GTX 1070 Ti comes with 8GB memory having 256-bit interface. When it comes with memory speed and bandwidth then RTX 2060 wins hand down, offering memory bandwidth of 336 GB/s while GTX 1060 has the lowest at 192 GB/s only. The memory bandwidth of GTX 1070 and GTX 1070 Ti stands in the middle of these two cards at 256 GB/s, which is also quite good too. However, 6GB VRAM can prove a bit on the lower side for 1440p gaming in this age, where the memory usage of latest AAA games can reach up to 5GB to 6GB. It is definitely not enough for 4K gaming where minimum of 8GB VRAM is recommended for AAA games. So, if I have to game at 4K then I would definitely prefer a card with 8GB or more VRAM. All of these Nvidia cards support DirectX 12, OpenGL 4.5, Vulkan, OpenCL, Nvidia Ansel, Nvidia GPU Boost, G-Sync, NVIDIA GameStream Ready and are VR Ready cards. The SLI multi-GPU support is available in GTX 1070 and GTX 1070 Ti only using the SLI HB Bridge. Out of these cards, only RTX 2060 is really capable of Real Time Ray Tracing and DLSS (Deep Learning Super Sampling) because of its dedicated RT Cores and Tensor Cores. Real Time Ray Tracing is an advanced technology to create lifelike images, shadows and lighting effects in games while DLSS is a new Anti-Aliasing technology that uses Artificial Intelligence and is more efficient and offers better performance over the older AA techniques e.g. TAA etc. It should also be noted that for Ray Tracing & DLSS to work, the game should support these technologies too. RTX 2060 is around 50% – 60% faster than GTX 1060, 12% faster than GTX 1070 and is as fast as the GTX 1070 Ti. Here are some benchmarks of RTX 2060, GTX 1070 Ti, GTX 1070 and GTX 1060 in popular AAA games. When it comes to power consumption then GTX 1060 is the winner and it requires only a 400W PSU for its working, but other cards need at least a 500W Power Supply for their working. The maximum power consumption is of GTX 1070 Ti at 180W while RTX 2060 power consumption figure stands at 160W only, which is great considering the fact that it is a bit better than the GTX 1070 Ti in performance. The cheapest card here in GTX 1060 at $299 MSRP while GTX 1070 Ti is the costliest at $449. RTX 2060 is priced very competitively at $349 MSRP which makes it a great value for money product, considering its performance is equivalent or slightly better than GTX 1070 Ti. It must be noted that these prices are for the Founders Edition cards only and cards from different graphics card manufacturers may vary depending on the model they offer. You can check out the current prices of these cards from the links given below. 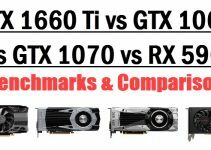 Comparing GTX 1060 to RTX 2060 is completely naive because both these cards do not come close to each other when it comes to performance. RTX 2060 is almost two segments above GTX 1060 and is a close competitor to the GTX 1070 and GTX 1070 Ti. In majority of the benchmarks it beats GTX 1070 Ti, and it also comes with extra capabilities too, that include RT cores and Tensor Cores. Also, when it comes to video editing then RTX 2060 has better encoder compared to the rest. In terms of pricing too, RTX 2060 clearly beats GTX 1070 and GTX 1070 Ti. The only thing where it lacks a little bit is the amount of VRAM and no SLI support. However, it is still very capable of running AAA games at 1440p without any issues at all. So, if I have to choose between them then I would certainly pick RTX 2060 for my gaming and professional needs. Really helpful article! Thanks for sharing man!